With the onset of fall, I usually segue from lighter wine and food choices to the more hearty fare this cool season seems to demand. But just not yet. Since I was unable to shed my winter coat (i.e., blubber) this summer, I’m forcing myself to eat lighter for the next few weeks. Yes, I hope to shed a few pounds, but I resolutely refuse to deny myself (and those within my ample shadow) the flavorful food or fruit of the vine we so rightly deserve. And while it may seem oxymoronic to say this, I am going to provide you with a recipe for some healthy comfort food along with a couple of wines that match up to them quite nicely. Yes, that’s right, low calorie, wine-friendly food that is not only delicious, but healthy too! Here are two excellent wines to accompany the meal. 2012 St. Supery Sauvignon Blanc ($20) – Citrus and melon flavors highlight this fresh, well-balanced wine. Excellent acidity and a long finish make this the perfect accompaniment to the halibut. 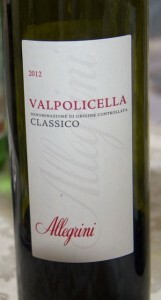 2011 Allegrini Valpolicella Classico ($14) – This northern Italian red has bright cherry flavors with a spicy tea-like nuance. This is a light to medium bodied red that pairs well – especially with the sauce in the halibut dish.